Hello friends! Zack and I will be spending the next 3 weeks in Houston, working on the business and spreading the word. It's hotter than Hades here, but we'll be done working in Texas shortly! We went to see the Red Sox play the Rangers our last week in Dallas and got to play at 6 Flags! It's nice to have a little down time after two years of working non-stop. This week's project is from a friend and she totally transformed this 70's buffet, turning it into a beautiful weathered oak show stopper! I don't have a true before photo for this project, since it had already been painted totally white before this makeover. 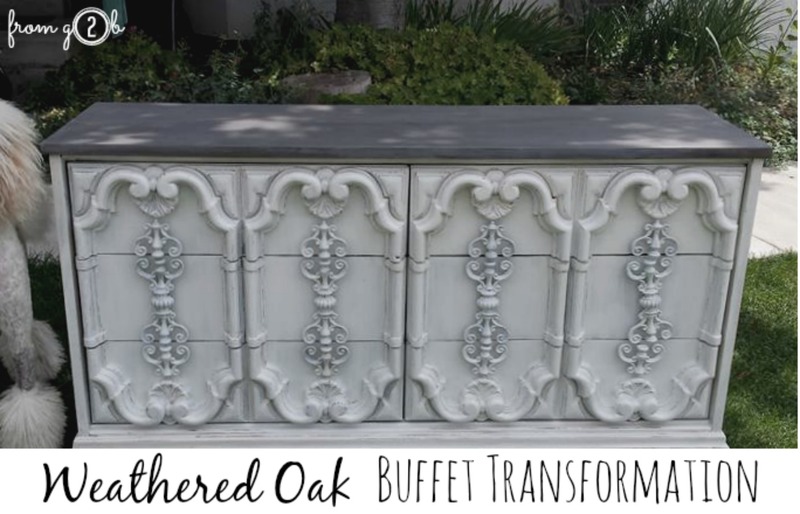 But you've probably seen this type of buffet before. I think at least half of my family members had something similar back in the 70-80's! 1.] 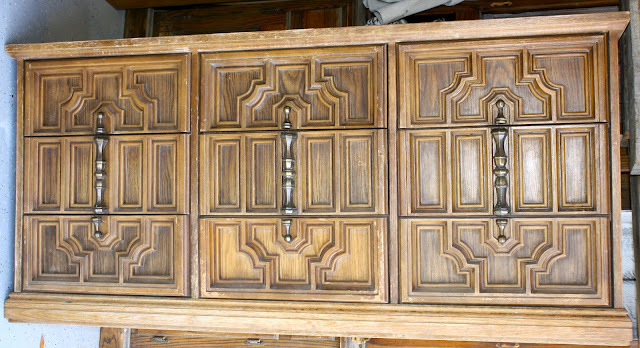 If you're refinishing an existing piece, you'll want to begin by stripping or sanding your project to strip the wood. For a flat wood top, I believe that sanding is just easier and less messy. 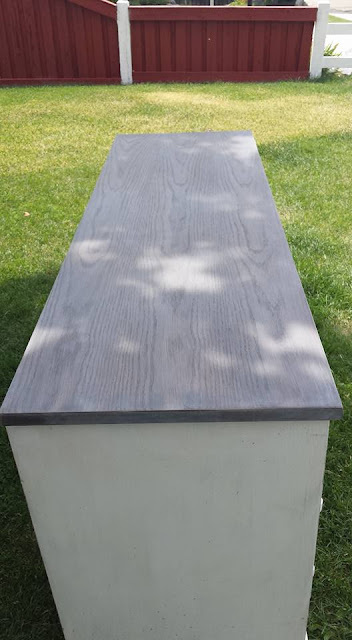 Sanding is important with a reactive stain to get an even finish. You want to sand until the old finish it totally gone and the wood looks powdery. 2.] Paint the base using a chalky type of paint, this will reduce the number of steps and prep work. Going from dark wood to this light color, be prepared to do two coats. 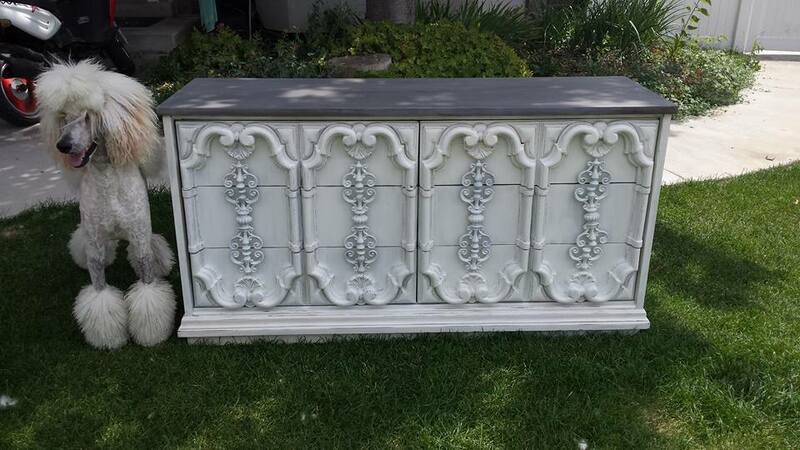 But since this piece was already white, it only took one coat of paint. FYI -This project was painted with a very light gray. 3.] The top was stained with Weatherwood Stain's Reclamation stain. Just apply it to the wood and allow it to react, do not wipe it back off. On a hard wood it takes about 30 minutes to dry and when the wood is dry to the touch, it's ready for a topcoat. 4.] To seal the wood, use Weatherwood Stain's White Maintenance Oil. The White Oil will lighten the stained wood, and create the look of sun-kissed patina. This is about the same level of wood protection as furniture wax. I always think it's so funny how awful an old piece of furniture can look until it has a coat of paint on it. I think the decorative old pieces look great painted in light or bright colors, it really modernizes them and gives them a second life. What did you think? Didn't she do a great job? It was that easy. Questions? Comments? Leave'm in the comment section, I'm always happy to help!